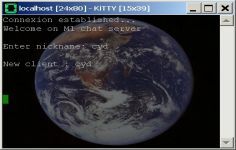 KiTTY is a popular version of the PuTTY SSH client – a communication software - developed to help you connect to remote servers using the SSH-1 protocol, SSH-2, Telnet and Rlogin using or not a proxy. In addition to the features of PuTTY, the application adds some new such as the session filter, portability, pitcher session, keystrokes, automatic passwords, record scripts, transparency of the main window, etc. It also allows you to assign an icon at each session to make automatic connections, hide active windows in the system tray, or to automatically run remote commands. With a simple and intuitive GUI, KiTTY offers some interesting and useful features such as protection against accidental keyboard input, hidden light chat server and a hidden text editor, pscp.exe and WinSCP integration and more. Curently we don't have any log information about KiTTY version 0.70.0.10 Telnet/SSH Client for PC Windows. We will this change log update soon!